So y’all may not remember from year to year what our Fall season is usually like. I want to tell our members the ways in which this season is unique, and the ways it is the same. In all the years we have been growing for East Texans, this week, the 4th week of October, has always been our starting date of the fall season. Every year we try and plan our fertility and timing just perfect so we can try to start earlier, but it has never worked out until this year. This year is different! After a super dry summer, August had a cool spell with two amazing rains and we jumped at the opportunity to try some late plantings of summer crops. It worked! And it led us to a 3 week early start to the fall season. Now those crops are winding down. There will probably be few cucumbers, squash, zucchini, or eggplant the rest of the year. This is totally normal, the plants have just run their course a bit earlier than most years, but they gave us a great harvest. Here’s how the season is normal: Our fall plantings of radish, turnip, kale, lettuce, arugula, etc. are all perfectly on time for harvesting near the end of November, just like they are in years past. But our summer crops may not hold out that long. We might have a few weeks there in the middle where only a few items are available. If that is the case, we may choose to take a couple of weeks off from harvesting in the middle of the season while we wait for the crops to be ready, rather than sending you guys smaller harvests (remember, your account is charged every week that we deliver, and if we cannot deliver you a harvest, you won’t be charged). Of course as the garden progresses we will keep you up to speed on everything and let you know what’s up. San Marzano tomatoes—Fall tomatoes are in! We are so pleased with how well they’re doing. Our small share members are receiving a quart of our most amazing heirloom Roma type tomatoes: San Marzanos. These tomatoes are low in moisture and peak in flavor. They’re great diced into salsa, or used in Italian cooking. Heirloom tomatoes—Large share members each received 5 heirloom tomatoes, perfect for slicing and eating fresh. A few Japanese Black Pear made it into some of the boxes (these are somewhat pear shaped with green shoulders that don’t fully ripen) but most of you received the Cherokee Purple and Brandywine tomatoes. Take note that some of your tomatoes are quite ripe and need to get used up quick, especially if they have blemishes, and some of your tomatoes may need a couple of days ripening on the counter. More are ripening and will be ready next week! Acorn Squash—One for the small shares, two for the large shares. These are the first of the winter squash varieties to mature, but the others are soon behind. Grill or roast these for a wonderful fall treat. 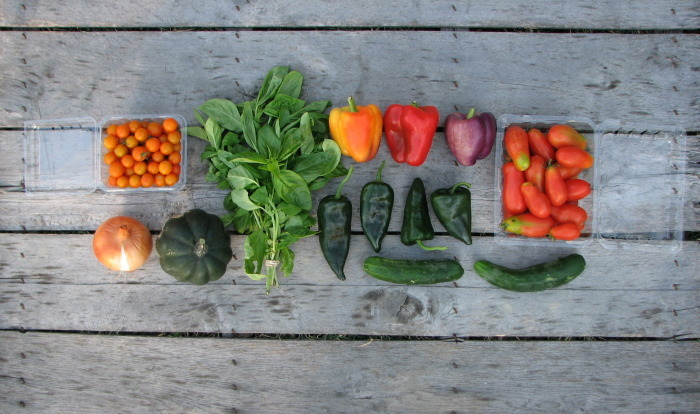 Bell peppers—Each share received a big handful of green, purple, orange, yellow, and red bell peppers. So much beautiful color comes out of the garden in late summer! Onions—Sweet yellow onions from our summer harvest. These have great flavor and low moisture. Sungold tomatoes—Enjoy another pint of the sweetest treat our garden gives. Basil—Nice, large leaved Italian Genovese basil. This crop is difficult to transport without it getting pretty wilty. When you get it, trim the stems and place in a glass of water as soon as you can. Poblano peppers—Each share received a handful of lovely, deep green poblanos. These peppers are excellent roasted or sauteed with scrambled eggs- Migas style, or get really messy in the kitchen and make Chile Rellenos! Cucumbers—This last week of cucumbers, they’re going into a lovely Mediterranean chickpea salad for tonight’s dinner. Some of your crops can be damaged by refrigerator temperatures, and some crops prefer it, so be sure to check out our veggie storage tips each week for proper storage of your loot. As a general rule, wait to wash any veggies until you’re ready to use them to help retain nutrients and prevent spoilage from excess moisture. The onions can be kept at room temperature. The eggplant, bell peppers, squash/zucchini and hot peppers will all like to be kept cool. They can stay out at room temp, but will only last a couple of days. In the fridge, you’ll have about a week. The cherry tomatoes will be damaged and begin to get mealy if stored below 50 degrees, so the refrigerator is not the place for them. 70 degrees is optimal for tomatoes, and they’re happy sitting at up to 80 degrees, so out on your counter or in some other cool place is perfect for them. Large Share Large Share (L to R): Bell peppers, cucumbers, heirloom tomatoes, poblano peppers, Genovese basil, yellow onions, sungold tomatoes, and acorn squash. 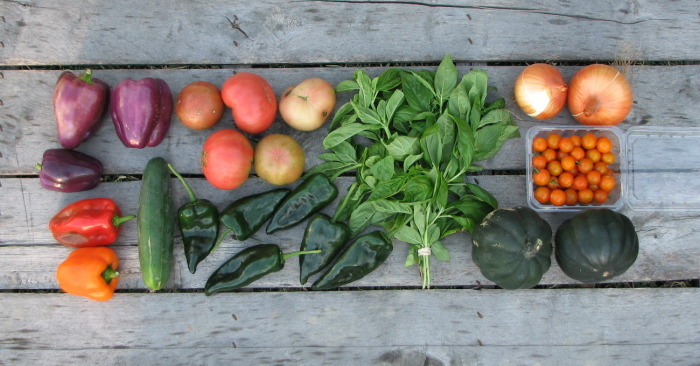 Small share (L to R): Sungold tomatoes, yellow onion, acorn squash, Genovese basil, bell peppers, poblano peppers, cucumbers, and San Marzano tomatoes.